From Leilo's mom: "This is Leilo. He bit the tip of my fingernail off, despite the nail polish on it, and ate it with such gusto that I couldn't pry it out of his mouth before he swallowed! 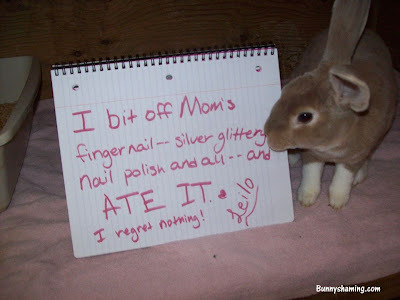 He's always had a thing for fingernails, but I was surprised when he went for a painted nail--that stuff tastes awful!"